"Estate kami," a tutelary kami enshrined on or nearby the plot of land on which a human dwelling is built. Most yashikigami are found in the form of small shrines made of wood or stone, or a makeshift straw shrine which may be rebuilt at the time of each regular observance of worship. In other cases, the kami's presence may be indicated merely by a cairn of rocks, or a tree or natural stone may be used to represent the kami's temporary dwelling or manifestation (yorishiro). Since the term yashikigami is an academic expression used to refer generally to any "tutelary kami of the dwelling," the actual terms used to refer to such shrines and their kami vary widely from place to place; some include ujigami, uchigami, jigami, and 地主神 jinushigami. In some cases, the shrines may be referred to by the proper name of the actual kami worshiped, such as Inari, Shinmei, Gion, Kumano, Hakusan, Tenjin, Ten, Hachiman, and Wakamiya. third, the type in which the kami is enshrined at the dwelling of a stem family, but participation in its worship is extended to collateral families of the zokudan as well. While the third type is thought the oldest, it is believed that the weakening of the structure of the old zokudan groups and growing independence of branch families led to proliferation of the second type. In turn, as branch famlies rose in affluence, they also gained autonomy as independent units of village membership, thus leading to the enshrinement of yashikigami by each individual household (the first type). The individual household enshrinement type also arose against the background of a popularized interpretation of the yashikigami as tutelary of individual family and home, and the teachings of mountain ascetics (Yamabushi) and other folk-religious practitioners to the effect that the yashikigami should be propitiated to prevent or eliminate curses on the family. While progressing toward increasing differentiation as noted above, yashikigami cults have also frequently displayed contrary trends toward greater inclusivity as the comprehensive tutelaries of broader geographical areas. This expansion has occurred as shrines of the first and second types became the core of extended cults involving the participation of a wider range of votaries, including individuals outside the kinship group itself. Worship of the yashikigami is generally observed twice annually, in spring and fall, precisely correlating with the interchange widely observed between the ta no kami (kami of the rice paddy) and yama no kami (kami of the mountain), thus suggesting a linkage between the yashikigami and other agricultural tutelaries. Further, occasional cases are seen in which the original pioneer cultivators of a locale, or the spirit of the earliest ancestor (sorei) is enshrined as a yashikigami, and if one accepts that the yama no kami and ta no kami are variations based on the ancestral spirit, one can posit a close relationship between yashikigami and ancestral spirit as well.
. ujigami　氏神 clan KAMI deities .
. 狩場明神 Kariba Myojin . In the estate of the Chiba Gas Company 、千葉ガス(株). 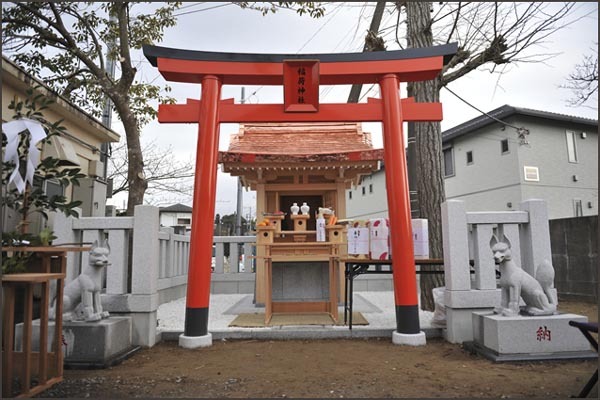 A small shrine located within a private residential compound. Also sometimes called a teinai shinshi. Some such shrines originated from the belief that a local kami already dwelled in the area before the building of the home, while others were especially dedicated to the "apportioned spirit" (bunrei) of the extended family's ancestral kami, or another kami specially revered by the family. A famous example of the latter type would be Taira no Kiyomori's dedication of the Itsukushima Shrine's central deity (saijin) in an auxiliary shrine (betsugū) built within the Taira's Rokuhara estate in Kyoto. kami thus enshrined in teinaisha subsequently came to be revered as local tutelaries. 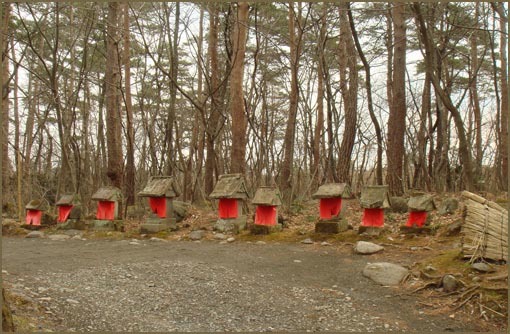 The majority of such examples are Inari shrines. Such private residential shrines were not normally given official ranks under the Meiji-period system of shrine statuses (shakaku seido). Today, one may find so-called "corporation shrines" (kigyō no jinja　) on the grounds or within a building of various corporations and factories and dedicated to prayers for corporate prosperity and employee safety; such shrines can be broadly considered as falling in the category of teinaisha. Further, in cases where the worship of such shrines is open to neighboring residents as well, the shrine may develop into the status of a local neighborhood tutelary or a cultic center with a broader clientele (one example is the shrine Suitengū in Tokyo). Some have a roof made of straw, others of rich families can be quite elaborate structures. Families come here to pray for the well-being of the clan. Many shrines for the estate deities are placed in the North-East corner of the estate, the KIMON direction.
. Kimon, the "Demon Gate" 鬼門 . estate deities . . .
Sasaki Choofuu 佐々木朝風 Sasaki Chofu "Morning Wind"
. WKD : kan moode 寒詣 visiting a shrine (or temple) in the cold .
. Misaki ミサキ / 御先 / 御前 / 御崎 Legends about the Misaki deity . In 落合町 Ochiai people have a small Hokora for Misaki, who is venerated as a 屋敷神 Yashikigami Protector deity of the Estate, near the North-Western side entrance.